Some of the clergy I respect most are women - why shouldn't they be? Some of the most irritating are men. Is that surprising? We are all human, with our good points and not-so-good points - a great cross-section of humanity. 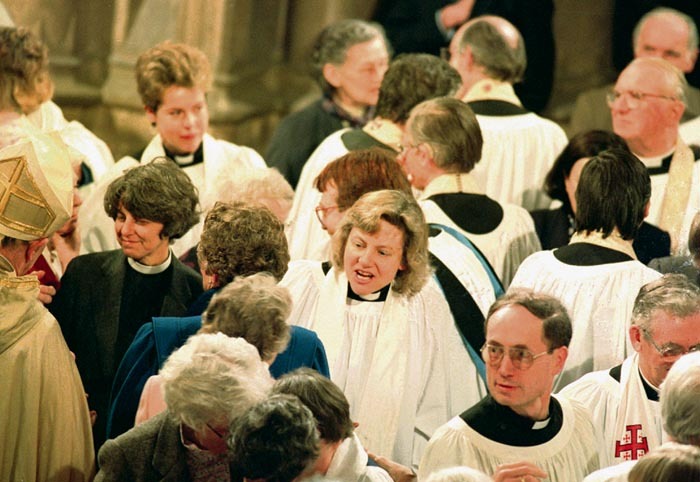 At any big church event, women clergy are commonplace; at a deanery service, for example, to an extent that it would now seem odd without them, just as much as a great variety of dress is commonplace. On the various committees on which I serve, there is quite properly a balance of men and women, lay and ordained. It is simply the way the Church now is. Friendships will blossom across the spectrum, and that must be all for the good. I have always been careful not to use the language of "invalidity", which, in this context of evaluating the contribution that women priests have made to the life of our Church, I do not believe is helpful. Lest we call into question all our orders, the most we can say is that there is, from a wider Catholic perspective, an element of doubt that the admission of women into the ministerial priesthood has introduced. This is not to insult women so ordained, but to stress that all our orders are to be tested against the mind of the Universal Church from which our orders are derived in the first place. This highlights the need for what we call sacramental assurance, because the one thing that the sacraments must be is sure and certain signs of God's love and presence (Supplement, 27 May 2011). So, for traditional Catholics, the problem remains about the place of the priest at the altar, but this in no way negates the very positive contribution that women have made in and through the ordained ministry. We need to continue to find ways in which we work together as closely as possible, while respecting at the same time our theological differences, and foster the highest degree possible of communion. one of the chief ways that this has been possible to do - although others see things differently, sadly - is through the Act of Synod and the passing of the two Resolutions A and B, given in the 1993 Measure. This has meant that priests and laity alike have been able to remain loyal to their convictions, and still engage on an equal level with everyone else. Sometimes, in the middle of a family feud, a little distance is helpful, when boundaries are drawn so that everyone can play on level ground and on a safe field. This has sometimes, mistakenly in my view, been seen as a threat to the unity of the Church, rather than recognising it as the mechanism through which that unity has been preserved over the years. Resolution C parishes have thrived and brimmed with confidence, as have many other parishes of a Catholic tradition, that have not needed to pass resolutions in the same way. The point here is that the Catholic tradition has been able to flourish in an unselfconscious manner, as if it were as normal as any other part of the Church. The givenness of these arrangements has been helpful, as they preclude any accusation of discrimination against women priests. I am clear that there is no question of putting the clock back. The Measure to admit women to the episcopate failed because it failed to secure adequate provision for this communion to continue. Women priests have been able to work alongside their male colleagues, both those who are able to accept them fully and those who doubt their orders. The distance that the legislation of the 1990s created has enabled the heart to grow fonder. We need to get on together at the practical level wherever possible, in order to create maximum effect to show the Lord's love for all his people. One practical example of this in my area is the coming together of a group of parishes in Camden to give shelter overnight to homeless people during the winter. Each church offers hospitality one night a week; pooling our resources. In the next-door-but-one parish, there is a woman vicar, and we are both pleased to be doing the same project on nights following each other. The guests enjoy telling us what the other church gave them for dinner the night before. This may be a small example, but it is precisely in these sorts of ways, in practical initiatives, that the gospel becomes attractive to outsiders. When people recognise its values being put into practice, then the message of Christ commends itself to the most unlikely people. Wrangling over theological questions diminishes; respect and confidence are nurtured. No longer do we think of that priest as "the woman vicar", as if there is something different about her, but simply as the Vicar of St Mary's. We will soon stop thinking and talking about "women priests" and "women bishops", but simply about bishops and priests. None of this is at the expense of glossing over the questions about the nature of the priesthood, which remain. They are the same questions as were around in 1992, and are in the current debate, and which will still be with us in the future. The nature of the theological difficulty with the ordination of women remains, while working alongside women priests is the reality of our Church today. Unity is not an optional extra for the Church. It is the Lord's will and his prayer for his disciples. Not respecting the boundaries that are forced on us through the nature of our theological differences can create only further disunity, both among ourselves and across denominational boundaries. Ecumenical co-operation has for some time played a significant part in our understanding of each other's traditions, as well as enabling a growing-together in mission and unity. There is still much to learn, and much growing together still to be done. It will happen naturally and joyfully, as we learn to live with our integrity (or integrities?) intact and secure in the life of our Church. The Revd David Houlding is Vicar of All Hallows, Gospel Oak, London, and a member of the Catholic Group of the General Synod. What difference does women’s ministry make?